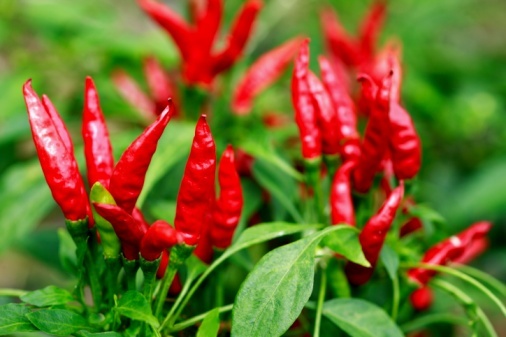 A new study examines the link between hot chilli pepper receptors in the stomach and feeling full. The transient receptor potential vanilloid 1 (TRPV1) receptors are activated through capsaicin—a substance found in hot chillies. Capsaicin is known for reducing food intake in humans, but when the receptor is deleted or removed from the signaling, it can lead to delayed fullness and the consumption of more food. Understanding the mechanisms involved in the TRPV1 receptor pathway and the effect capsaicin may play in preventing overeating is an exciting stage the researchers have achieved. “The next stage of research will involve investigation of the mechanisms behind TRPV1 receptor activation with the aim of developing a more palatable therapy. [Furthermore, we will] determine why a high-fat diet de-sensitises TRPV1 receptors and investigate if we can reverse the damage,” adds study author Dr. Stephen Kentish. Kentish, S.J., et al., “TRPV1 Channels and Gastric Vagal Afferent Signalling in Lean and High Fat Diet Induced Obese Mice,” PLOS ONE 2015; 10(8): e0135892, http://journals.plos.org/plosone/article?id=10.1371/journal.pone.0135892. University of Adelaide, “Hot chilli may unlock a new treatment for obesity,” ScienceDaily web site, August 18, 2015; www.sciencedaily.com/releases/2015/08/150818142710.htm.